The growth in global carbon emissions in 2014 was flat for the first time in 40 years, even though economic growth was at 3 percent, said the International Energy Agency (IEA). China’s shift to clean energy was a key driver behind the improvement. Global greenhouse gas emissions didn’t rise in 2014, according to the IEA data. The CO2 emissions were 32.3 billion tons in 2014 the same as in 2013. "This is a real surprise. We have never seen this before," the IEA chief economist, Fatih Birol, and incoming executive director, told the Financial Times. This is not the first time the growth of emissions fell or stopped rising. Previously this was led by a significant economic downfall when lower energy demand led to production slowdowns at factories and power plants. The US recession in the early 1980s, the collapse of the Soviet Union in 1992 and the 2009 global financial crisis are the major occasions in four decades when the growth of global emissions has stalled. However, the global economy grew 3 percent last year, and with it a growing world demand for fossil fuels. The share of fossil fuels within the world energy supply has been relatively unchanged over the past 41 years, at around 80 percent, according to the IEA. World energy demand for fossil fuels plays a key role in the upward trend in global CO2 emissions; lately the world has seen a significant shift towards cleaner renewable energy. China, the world’s biggest carbon emitter, has significantly cut its coal production, which has been determined by the IEA as one of the major reasons for the global carbon emissions’ stall last year. Wealthy OECD countries have also shifted towards renewables, setting stricter energy standards to separate economic growth from increasing emissions. Their economies grew nearly 7 percent while emissions fell 4 percent over the last 5 years, the IEA reports. China’s carbon emissions fell 2 percent in 2014 for the first time in more than a decade as the country declared a ‘war against pollution’. 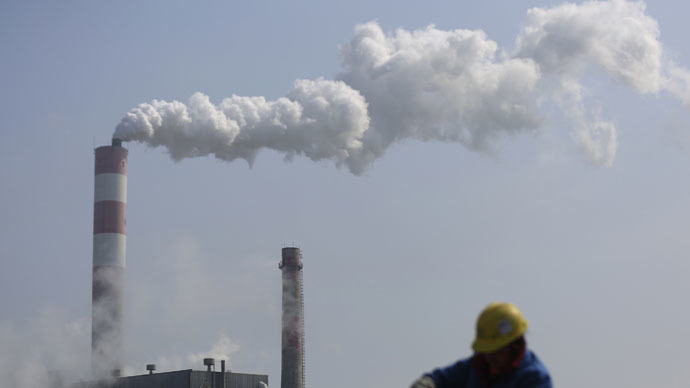 The Chinese government announced last week plans to cut coal consumption by 160 million tons by 2020 and up its use of non-fossil energy to 15 percent by then. China’s coal consumption fell 2.9 percent in 2014 its first drop in at least a decade, with an accompanying 1 percent fall in carbon dioxide emissions. The country's current coal consumption accounts for about 66 percent of primary energy use, 35 percent higher than the world average. China’s government is trying to curb its coal production dependence as the nation is facing harmful levels of air pollution that drastically affects the quality of life there. Only eight of 74 China's major cities met the country's air quality standards in 2014. Severe air pollution has been linked to a spike in lung cancer in Beijing and a reduced life expectancy in some regions of 5.5 years. Last year’s study by green group the Natural Resources Defense Council revealed that pollution from the coal industry killed 670,000 people in China in 2012. China has become the largest installer of renewable energy across both wind and solar, the country has already invested about $89.5 billion in clean energy. It also aims to lower the overcapacity in production of industrial materials, such as steel and cement which are large consumers of coal. Electricity consumption, which had been growing at 10 percent a year, has fallen to about 4 percent as China shuts old factories and shifts away from heavy engineering. The International Energy Agency will publish a detailed report on climate change along with the energy measures’ recommendations in June.